After year-long research, the results of the scientists working at the Institute of Technical Sciences of SASA begin to gain wider recognition: since January 17, the paper Jugovic, D. & Uskokovic, D. 2009, "A review of recent developments in the synthesis procedures of LiFePO4 powders, Journal of Power Sources", vol. 180, no. 2, pp. 538-544, doi:10.1016/j.jpowsour.2009.01.074 is the eighth most downloaded article from this journal. The Journal of the Power Sources (2009 Impact factor: 3.792) is a renowned journal in the field of Li-ion batteries. The growing interest in that area of research is best illustrated by the fact that that seven out of ten most downloaded papers deal with Li-ion systems. The paper published by researchers of the Institute has 25 citations in Scopus and 22 in the Web of Science; during 2010, it was cited 19 times in Scopus and 18 times in the Web of Science. It already has four citations in papers published in 2011 in Scopus (three in the Web of Science), which shows that it is reasonable to expect further rise in its citation counts. Researchers of the Institute of Technical Sciences of SASA developed a series of innovative methods for the synthesis of various materials for Li-ion batteries. During the past several years, their research was primarily focused on LiFePO4, the most promising cathode material due to its excellent electrochemical properties, non-toxicity and thermal stability on higher temperatures. It has various applications not only in fuel cells for small electronic devices but also in electric and hybrid vehicles. The Boston Consulting Group estimates that 14 million electric and hybrid vehicles may be sold in 2020, whereas the estimated value of the electric car market is about ten billion dollars. However, in order to achieve this, it is necessary to face serious technical challenges. The most important of them is related to manufacturing batteries that meet the requirements of car industry: small weight, long life, high energy and low cost. The first series of hybrid electric vehicles equipped with Li-ion batteries was launched by MERCEDES BENZ (S400 Hybrid) in 2010; these cars have significantly lower CO2 emission (20 percent). In the years to come, several other car manufacturers are expected to follow the example of Mecedes Benz. We have recently announced a new method for the synthesis of LiFePO4/C composite developed at the Institute of Technical Sciences of SASA. The developed synthesis procedure is simple, inexpensive, ecologically safe and does not necessitate expensive or specialized equipment. It is based on the precipitation of an Fe(II) precursor in molten stearic acid and an additional thermal treatment of the precipitate. The obtained powders exhibit excellent electrochemical properties, reaching 94% of the theoretical capacity for this material. A patent application describing the synthesis procedure of LiFePO4/C was submitted to the Republic of Serbia Intellectual Property Office (Preparation of composite of lithium iron phosphate (LiFePO4) and carbon by precipitation method in molten stearic acid, P 2010/0488). The new method is also presented in the article Jugović, D., Mitrić, M., Kuzmanović, M., Cvjetićanin, N., Škapin, S., Cekić, B., Ivanovski V. and Uskoković, D. 2011, "Preparation of LiFePO4/C composites by co-precipitation in molten stearic acid", Journal of Power Sources, doi:10.1016/j.jpowsour.2011.01.072 (Available online January 26, 2011). 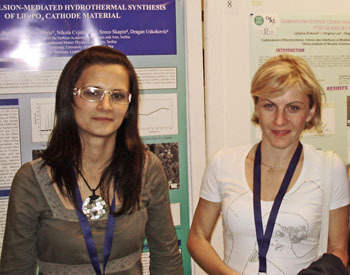 The research team engaged in the characterization of the obtained powder also included researchers from the Faculty of Physical Chemistry, University of Belgrade and Vinča Institute of Nuclear Science, whereas high-resolution characterization of the material was carried out at the Jožef Štefan Institute in Ljubljana. The concept RESEARCH – EDUCATION – INOVATION has been developed at the Institute for a long period of time. It implies the education of young researchers through the work on their MSC and PhD theses. The results presented in these theses act as the basis for high-quality papers published in journals with a high Impact Factor and patents that could be transferred into industry. Along with the research into biomaterials, the study of cathode materials for Li-ion batteries at our Institute is another example of a well-designed research whose results stand side by side with those of the leading international laboratories. We are currently searching for potential partners interested in commercializing these results.